I’ve heard a lot of jokes about racing. I saw a tattoo of a six point buck with a big red crosshair on it. I saw teeny bikinis on, well, nothing that could be described as teeny. But I also met the legendary Indy Car announcer Tom Carnegie. I stood on the track of the Indianapolis Motor Speedway. I witnessed the “kissing” tradition. 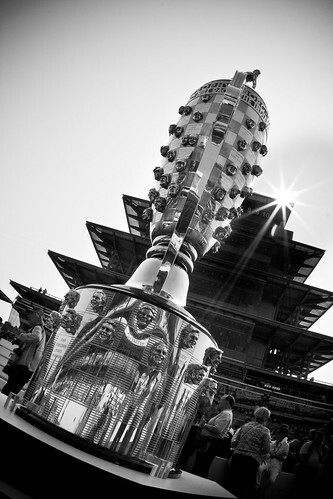 I stood close enough to smell the Borg Warner Trophy. My new favorite sound is that of an Indy Car starting up. 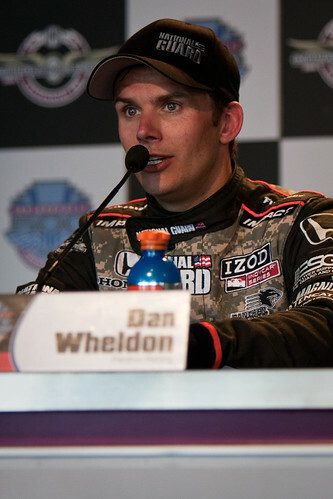 Dan Wheldon is a stand up fellow, and he sounds just like the Geico gecko. 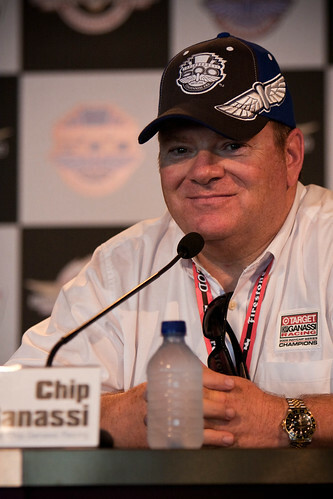 I would be friends with Chip Ganassi. 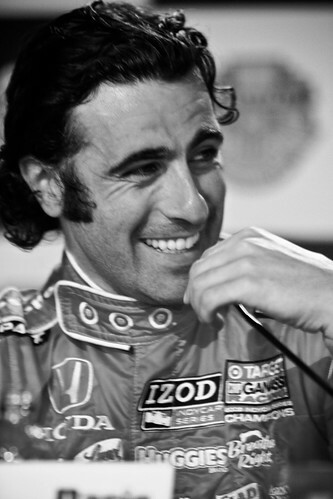 Dario Franchitti finished the race with 1.6 gallons of gas to spare. I may not understand racing as much as the people I shared the press room with, but I understand a good human being and the look of a proud wife as her husband gets a little choked up as he admits that the real people who helped him win are the ones who are never going to get the real attention they deserve. Wow – you got amazing pictures. I love the sound of the race cars as they start up and when they speed past your seat in the stands. Although I have only been to nascar so I can’t compare the two. But the sound of nascar makes my heart race. It was great meeting your briefly at CBC10. I have yet to understand Nascar but your fabulous pictures have me a heck of a lot more curious. I especially love the last one! Didn’t get a chance to meet you at CBC10 but I’ve heard fabulous things about you. So glad I finally discovered your site–your photography is beautiful! @Emily, Oh honey, this isn’t Nascar, this is Indy Car, Nascar are the ones that look more like regular cars covered in stickers. 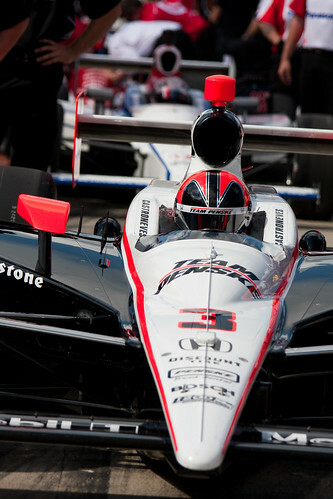 Indy Car looks more like pure awesome. @Emily, I didn’t know the difference until a year ago. Maybe even less. And I don’t even have blonde or four babies or living far away as a good reason for not knowing. Promise you’re not alone. PROMISE. @Casey, Okay, I feel a little better. I have to go now. So cool. @Michelle, Aren’t they delicious? It’s so rare that cars sound cool anymore. 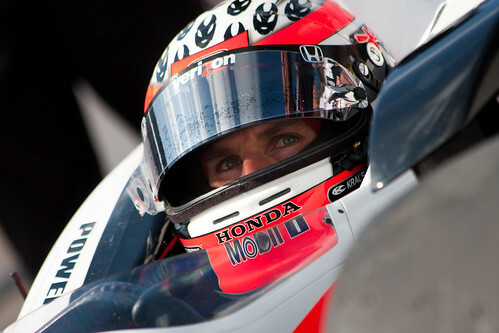 Indy Car will remain my favorite type of racing. The 500 will always be my favorite race. I’ve only been to one 500, but I grew up outside of the Indy viewing area, so was always able to watch it on television. This year, I watched it while the rest of my family was on the Gulf Coast beach in Florida (no oil!). You’re pictures are, as always, amazing. Also – you met Tom Carnegie? I’m so incredibly jealous! @Nikki, I think the best part is that I get it now. I can’t wait for next May. And Tom Carnegie? He’s my new boyfriend. Seriously can I have your autograph? You amaze me. Your photos are so LIFE. @Adventures In Babywearing, I’ll send you a Hallmark card. My dad starting taking me to the track with him for time trials when I was 8. I was 10 when I was finally deemed worthy enough to have my own actual ticket to the race. I was so in love with Al Unser, Jr. that I once called Methodist Hospital when I heard he was there after a crash . . . and they let me through to talk to him. My 11 year old self stammered something silly and I was on cloud nine. I tear up every time I hear Jim Nabors sing “Back Home Again in Indiana.” Yeah, I get it. As a first time spectator you got it, too. Awesome photos, Casey. I love them all, but the one of Ashley is my favorite – the pride and the love for her hubby. @Angie @ Just Like The Number, Oh I love that story. I think I realized yesterday that the stereotype of racing gets in the way of the drivers and the real fans like you. MUST FIX. I loved this!! As a Hoosier living far away from home, Race Day has special meaning for me! People around here don’t get it but my husband indulges me and we had the race on the whole day. Your pictures are beautiful and you’re lucky that you were able to attend the greatest spectacle in racing!! Thanks so much for sharing with all of us! @Sarah, I totally get now why Hoosiers who have moved away get so homesick on the last Sunday in May. Heck, I came home and watched the whole thing again with Cody! I am so jealous. Can I come with you next year? I’ve never been to Indy but always wanted to. @Hockeymandad, Of course you can. It must be on everyone’s life list. MUST. @Casey, Can you get me a press/garage credential too? If you can, I will totally hold you to that. I’ve been to many tracks and that is #1 of 2 must sees left. our whole family sat at watched the entire thing yesterday….envious as heck that you got to be there. ha. I am SOO HAPPY FOR YOU. Also, your pictures are amazing. @alimartell, You could hop your dog up on a bunch of uppers and make her run around 500 times. BOOM! 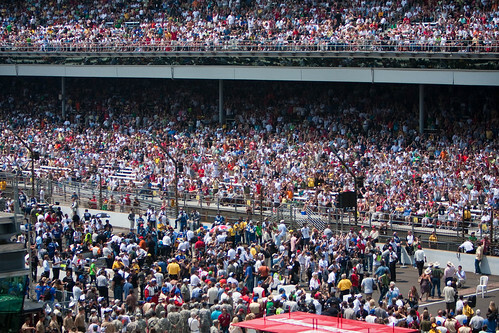 Indy 500. As a 22 year Indy 500 veteran I want to congratulate you on “getting it”. Certainly I started going and keep going for the racing, but the event itself is simply unbelievable to me, even today. Your photography is beautiful and gives me chills. Just 364 more days and I get to do it all over again. Thanks for this post. @Eric Wasson, I feel I’m now part of the cool kids club. Or something like that. Indy finally feels like home. And I love it. So amazing that you were allowed to go. You caught some incredible moments there, as well. I’ve been “maybe” moving to Indy for about 3 years now, so maybe one day I’ll get to go. I went to the Indy 500 in 1994. LOVED. IT. Not a race fan by a million miles. But LOVED. IT. So, how were you able to go in your official capacity? Casey–you aced it! Thanks for your commentary and photos. I have only been 3 times–once in the 70′s (disastrous race–two days of rain and horrendous wrecks, spectators injured etc. –didn’t finish until the third day and I had to go back to work and never saw it). So no interest in Being There for a lot of years although always tried to be out of state to watch on TV, or at least listen to the radio on a boat in Indiana. In 2000 had the incredible opportunity to be at the track as part of Lyn St. James sponsor team. (She is my friend and racing hero!) Went back again with Lyn in 2001. Awesome experiences that I will never forget. Love that 4 women were in this year’s race–love that Danica had a top-ten finish — love that three of the four finished the race — love that Sarah is a team owner determined to succeed. thanks for your wonderful chronicles especially Tom Carnegie! @Barbara Weaver Smith, I think so many people think the race is just for shirtless men, when the truth is the stories go so much deeper than that, it’s just easier to focus on stereotypes. I’ve lived in Indy for 16 years and I must say that the Indy 500 and the Colts are my two favorite things about this city. I’ve only been to the race 3 times and its been a few years since the last time, but it was so much fun. I’m not really all that into the actual racing part but hearing the cars that close always gave me chills. Your pictures are great! 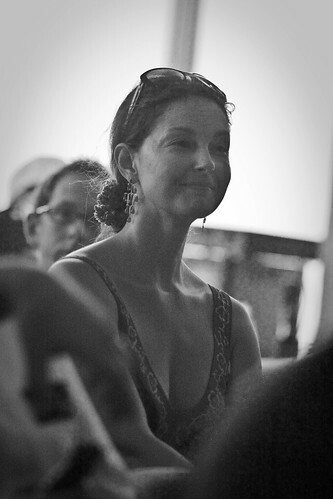 I absolutely love the one of Ashley Judd. She looks so proud :). @Rhona, I’ve still never made it to a Colts game, but I did do the DCI in Lucas Oil and can just imagine. D.A.N.G. Whatever credential you got ahold of is my life long dream. What an awesome experience. 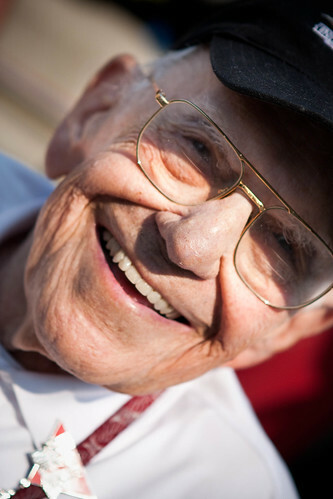 And I’m so glad to see Tom Carnegie’s pic — he looks awesome! The kids were too noisy yesterday, and I never heard if he was in attendance or not. I can rest easy, now! @Ronda, He made an announcement just before the starting of the engines, but since he was in a wheelchair he was behind the main podium, I could only see him from where I was standing. I’m not sure anyone knew it was him. And then AND THEN? He was left alone in his wheelchair while everyone rushed to the rails to watch the cars take off. Not much makes me mad, but that kind of ticked me off. The best 500 I went to was when I was greatly pregnant with my oldest. The stealth bomber flew over (http://custodialsmackdown.files.wordpress.com/2008/08/b2.jpg) right after the National Anthem. I was a sobbing mess and wept the entire race. I also used the restrooms 1278 times (which wasn’t a highlight and made me cry, too). @Lizzy, Oh no. I can just imagine. I’m not even pregnant but the whole Taps performance had me in hysterics. Surrounded by male journalists FTW! The pictures are gorgeous! Seriously!!! Love the gun show pick and the Dario F. (swoon!) pic and Ashley Judd pic…. @Indianapolis Amy, I wish I could have taken a picture of how awkward it was to be invited to a gun show. It still makes me shiver. Amazing pictures!!!! Thanks for sharing your pictures and your perspective on the race. It was so great to meet you this past weekend at the CBC! Your so super cute!!!!! I loved all your pics from above, especially the ones for Memorial Day. Great pics!!!!!!! @Casey, That’s because we run in different circles, I suspect! LoL. I’m an Indy native living in Argentina. Believe me, after never missing a race growing up, now I’m 10,000 miles away. IMS is the definition of beautiful to me. I miss it every year. Soooooo jealous! 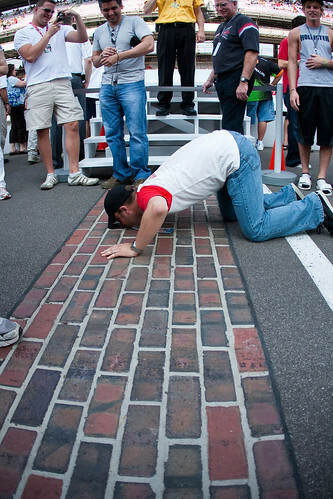 One of these days I’m going to make it down to Indianapolis…. Did I mention I’m soooo jealous? @Gav, Well get that jealousy to get you in the car in 363 days and GET DOWN HERE! “Just don’t get it? !” Oh boy. 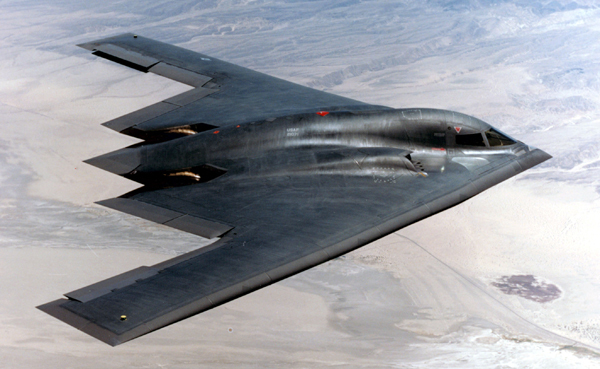 Sit in the stands, hear “Back Home Again in Indiana”, see the stealth bombers and planes fly overhead, see the fleet of 33 as they start the pace lap. Chills, baby. Nothin’ but chills! Oh, man. I was introduced to my first Indy race 2 years ago in Richmond. TOTAL. AWESOME. My husband’s stepdad works for Bridgestone/Firestone so we got passes to pit row. We got to walk right up to the tents and trailers, and they rolled the cars literally right past us! I still have the pictures – they’re on my FB somewhere, I’ll have to retrieve them. But you’re right, the cars are beyond cool. And the way they sound… mmmmmmmm. It’s something you can’t imagine unless you’ve been there. Even just watching it on TV doesn’t do it justice. And I LOVED the fighter jets and the Golden Knights parachuting down with the American flag – it’s all just such an awesome experience. I can’t imagine getting to get as close as you did, even up on the TRACK! Oh, and I had no idea Ashley Judd was married into the Indy family either – very cool! 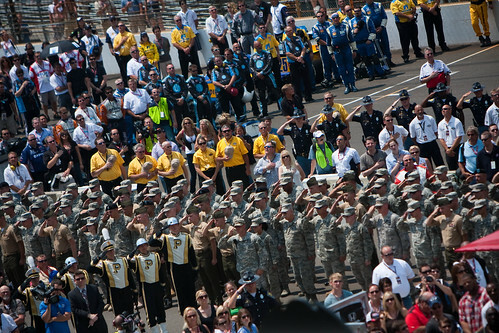 Oh, and PS… Indy totally trumps Nascar in my book. I think it’s great that you appreciate it and those photos are fab. Especially of the cute wife (of someone I should know the name of, right?). Now I live literally 10 miles from a Nascar track. And I avoid it like the plague. As a lifelong Pittsburgh girl who moved to Indy almost four years ago, I figured I “owed” it to myself to see what this IndyCar stuff was all about. Went to my first race three years ago, and have been back every year since. There’s just something about the atmosphere, the sound, the tradition… all of it. Totally jealous of your press-room view of the action – great pics! Glad you enjoyed it!